Today I seek to come to grips with Georg Wilhelm Friedrich Hegel, the late 18th and early 19th century German philosopher. Why Hegel? Because of Hegel’s influence on a broad range of philosophical movements and traditions that have sprung up over the last 200 years, and because there are elements within his system of belief that strike me as manifestly false (and, consequently, serve as a false foundation for spin-off theories), and I seek to articulate why. Kant is wrong when he says that we cannot directly experience the world but can only experience the world through the medium of our minds, such that we know only the illusion of reality rather than reality itself–this is termed “estrangement”. We can show that what we perceive is real by demonstrating that it is logically necessarily rational, that it could not be otherwise, thereby overcoming estrangement. We can only demonstrate rational necessity about things that have existed in the past; therefore philosophy is not predictive or speculative but is an inherently historical endeavour. The synthesis takes the good of the thesis and antithesis and leaves the bad. It is not a compromise between the two–it is wholly superior to both. Say for instance I propose the thesis “the state is all-powerful” and you propose the antithesis “the state has no power”. 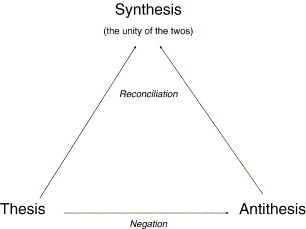 The synthesis would contain the true elements of both leaving the false elements behind. The end of human endeavour is freedom–not in a negative liberty sense (as in not being restricted from X, Y, Z) but in a positive liberty sense (as in being able to achieve one’s goals and objectives, to impart one’s personality and vision upon the world). Freedom progresses through four cultures, the oriental (in which only the ruler is free), the Greek (in which everyone identifies with the state unthinkingly), the Roman (in which the state is universal and uses everyone), and finally the Germano-Christian (in which everyone identifies with the state rationally). The modern state (by which Hegel means the state of his period–the 19th century Kingdom of Prussia) is the manifestation of the community rationally identified with. Property rights (individualist) serve as a thesis; our Christian moral conscious (communal) serves as an antithesis; the synthesis will be “ethical life”, a reconciliation of the individual with the community. Family serves as a thesis (a limited group to which we are sympathetic without calculation); the wider economy serves as an antithesis (a universal group with which we are self-interested); the synthesis will be the state, a universal communal sympathy that represents and cares for and rectifies disputes among various economic interests. The state should be a monarchy as the monarch embodies the state’s universality, and through this we can see that only through the state have we been able to rectify the split between the individualism of our economic system and the communalism of our Christian morality. An interesting split opens up in the ensuing generation of philosophers after Hegel. On one side are the Right Hegelians, who believed that Hegel’s conclusions about the state matched up with his methodology, by which I mean that they referred to the state as it was and not how it should be–the 19th century Kingdom of Prussia as it existed was being deemed rationally necessary, and Hegel’s argument’s normative value, to the extent that it had any, was conservative. On the other side are the Left Hegelians, most notably Karl Marx, who believed that Hegel’s conclusions about the state were not reflected by his methodology, by which I mean that they referred to the state as it could and should be rather than how it was–the 19th century Kingdom of Prussia was deemed inadequate at achieving Hegelian freedom and new alternatives were proposed. Left Hegelians essentially drop Hegel’s point about the impossibility of knowing or speculating about the future–Marx speculates about a socialist and communist future that is very much at odds with traditional Hegelian thought, which deemed such speculations logically impossible. To this point, all I have done is offer the reader an introduction to Hegel and demonstrate some facility with his system of thought. What are my particular problems with Hegel? They are dispersed throughout the structure I laid out above. Kant offers what amounts to an unearned sceptical view. To say that we cannot know reality is itself a knowledge claim about morality. On top of that, it is not a useful claim, because it does not offer us anything. If we believe Kant here, then we must reject Kant everywhere else (Kant is anything but a sceptic on moral issues–he makes very clear, objective claims about ethics), because all Kant can pronounce upon is illusion. Rather than rejecting the unearned scepticism of Kant’s position, Hegel seeks to at once embrace is and wriggle out of it. He wishes to accept the reasoning by which Kant comes to the conclusion that what we know is illusion and not reality without agreeing to that conclusion. His conclusion may be preferable to Kant’s in so far as it does justify something rather than nothing at all, but it is no more validly reached than Kant’s position is. It is still founded on the same unearned sceptical move that Kant made, namely to deny that the senses and the mind can give us objective knowledge of the real world. Hegel allows us to know the real world only by logically deducing that it can be no other way from what it appears to us to be, thereby making our illusions rationally necessarily true pictures of reality. He still embraces the sceptical argument that says that we cannot directly learn about the world through the senses and the mind. If Kant’s sceptical argument is unearned and of no value, then Hegel’s sceptical argument is also unearned and of no value, despite the fact that many of Hegel’s conclusions may be very attractive. I’m very partial to the notion that the state reconciles individualism with communalism, but the way in which Hegel reaches this conclusion is fundamentally misguided. Could some of Hegel’s conclusions be correct? Possibly, but if they are correct, they are correct for non-Hegelian reasons. There are many smaller criticisms one could make (Hegel’s theory of history is extremely racist and arbitrary; Hegel’s moral and communal conception is dependent on Christianity; the dialectic has a variety of limitations, and so on). But, broadly speaking, I think the accusation of unearned scepticism is most foundational and most total in its power of refutation. The self-defeating argument is an inadequate response. To ask the sceptic whether he “knows that he doesn’t know X” is to ask whether he is certain that he is not certain about X, which is a contradiction because you have already defined he does not know X. So therefore you must something different when you ask whether one “knows they knows” so it is your prerogative not the sceptic’s to explain what you mean. 1. It is always possible that our traditional means of making knowledge claims (the senses, experience, our reasoning) are being deceived. 2. Therefore, it is impossible to make knowledge claims. However, “it is impossible to make knowledge claims” is itself a claim that can be either true or false, so a true sceptic must be sceptical even of scepticism. At this point, scepticism does not amount to a coherent position. In order for a sceptic to actually put the sceptical belief into practise, a self-suspicious nihilism is the result. Such a belief system is impractical and is in truth practised by no one. We all act as though we know water is good for us and is generally not poisonous, or that air ought to be breathed. In our daily living, we constantly act in refutation of the sceptical hypothesis, and so the sceptic is both deeply impractical as well as hypocritical. But you are not addressing the problem. If the sceptic says he cannot know something – by which he means he cannot be certain of it – you need to be clear what you mean when you say the sceptic cannot be certain of his own uncertainty. The practical dimensions do not address his contention directly. It is consistent for one to be a philosophical sceptic but not a consequent sceptic. Does it make sense, for example, for me to say that I cannot be sure that it is raining on Mars, only for you to respond “How do you know you are unsure?”. The best way to address the sceptical argument is not by getting caught in his net but wriggling out of it. Specifically, the sceptic makes a very specific assumption about “knowing” which is equivalent to being certain about something. But clearly this is not the everyday use of “knowing”. I can say, for instance, that “I know I saw a UFO yesterday”, only for my friend to show me that it was actually a streetlight that I saw in the distance. In which case, I can say (sensibly) that “I thought I knew”. The sceptic is not saying “I myself am uncertain”, the sceptic is saying that not only is he uncertain, but that no one can know, and anyone who claims to know is wrong. That is a much stronger and bolder claim. It involves a series of assumptions about epistemology and about the capacity of minds with which the sceptic is himself unfamiliar. The sceptic does not say “I do not know if it is raining on Mars”, the sceptic says “No one knows if it is raining on Mars and anyone who claims to know claims falsely”. Yet there is considerable evidence that it is not raining on Mars, and no evidence that it is. If it is not a permissible move to make a knowledge claim when the ratio of evidence in favour of the given conclusion to the ratio of evidence against it is infinite, it would never be possible to make a knowledge claim, but this would only be true because the sceptic has chosen to define “knowledge” such that it presents conditions that cannot be met. The argument is circular. As I continue to read your post, you seem to be saying that this is more or less what you believe, and that you think I should make this argument straight out rather than argue the impracticality of scepticism, yet I would argue that this is merely a different permutation of the practicality argument. You seem to be saying that if we conflate knowledge with certainty that we set up an impossible standard, one that is wholly inaccurate, and one that is reliant upon defined and known conceptions of words that are also at odds with scepticism. I agree with you, yet this seems to me to be a problem precisely because it is not useful or practical to define knowledge in that way. For example, in the external world case, I might say “I don’t know that there is an external world” to which you would reply “How do you know you don’t know?”, implying there is a possibility that I don’t know that I don’t know, meaning that I could actually know without knowing it, which doesn’t make any sense! To say that we do not know our senses tell us true information about the external world is to claim that the evidence in front of us is wrong without evidence. We routinely base our behaviours and actions on what we believe we know. For instance, our senses and experiences and reasoning have given us a working knowledge of the sciences which we have used to fly people to the moon. If our knowledge was not accurate, we could not fly people to the moon. Now, it is of course possible that a Cartesian demon is deceiving us about our ability to use science to go to the moon, but there is no evidence that the Cartesian demon (or any other sceptical hypothesis for that matter) is true. In order to embrace the sceptical position one must actually make a very bold knowledge claim without evidence, namely that the world we see in front of us is not the true world.